Shipwreck, originally uploaded by Margaret Clift McNulty. This image is a step away from my work with portraiture and wedding photography. My feeling is, it's really good for me to shoot different sorts of scenes and subjects - it reinvigorates and reinspires my style so I never get bored and I don't get boring. 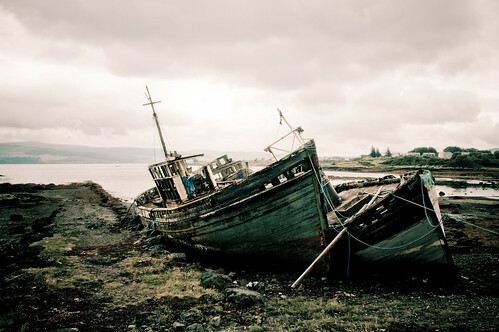 I stumbled across this derelict ship last weekend on Mull - it was a fabulous weekend in celebration of our first wedding anniversary (so not entirely off topic!). This wreck jutting out against the rolling clouds really captured my imagination - it tells a thousand stories and helped me to think about colour, shape and texture in different ways.